The cradle of ancient Egyptian burial sites, the attractions of the Nile Valley are legendary and can't fail to impress. The amount of epic things to see and do in Luxor and Aswan can be quite overwhelming. Be sure to stock up on sun cream and water because the majority of the attractions in the Nile Valley are exposed to the sun and sightseeing can be a hot and thirsty business. The world-famous Temple of Karnak in Luxor, built over a period of 1,300 years, is still one of the architectural wonders of the world and one of the biggest religious buildings ever erected. It is one of the most popular attractions in Egypt and will astound visitors. It is not, however, the only temple complex of note in the area. The Temple of Medinat Habu, mortuary temple of Ramses III, is second in size only to Karnak and features incredibly well-preserved wall carvings. The vivid colours painted onto ceilings, columns and walls are still clearly visible which makes the place feel alive and gives an amazingly authentic understanding of how it must have looked and felt 4,000 years ago. 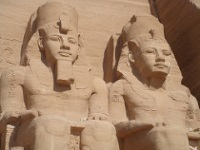 Abu Simbel, which includes the mortuary temple of Ramses II, is also a must-see. Twice annually, in February and October, the rising sun illuminates the inner sanctum of the temple, just as Ramses II decreed it should. Abu Simbel is humbling in its age and enduring magnificence. The West Bank, an area strewn with ancient tombs and temples carved into the limestone hills of the desert, can occupy visitors for days. 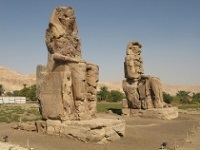 Highlights include the Colossi of Memnon, and the tombs of Tutankhamun and Ramses II in the Valley of the Kings. Don't miss the Valley of the Artisans (Deir el-Medina) which is just south of the Valley of the Queens and was once inhabited by the craftsmen and artists who worked on the nearby royal tombs. It is often called the Workmen's Village and you can still stroll around the remains of the buildings where these talented people lived and worked, as well as explore a number of remarkably preserved tombs. There are two great museums in the Nile Valley. Aswan's Nubia Museum is the ideal place to get a grasp of the rich Nubian culture and history, as well as some context for the ancient treasures of the area in general. 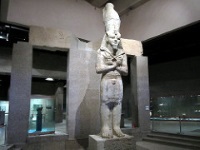 The Luxor Museum houses an impressive collection of artefacts from the valley.